All of us dedicated cat parents know just how much time it takes cleaning after your pet. You find yourself having to empty the little kitty’s litter box, just when you were about to do something else. Dumping the dirty litter clumps into the waste, having little pieces of litter scattered around, not to mention the smell of it… aaaarrrrrgggghhh!!! Changing your cat’s litter can be a cinch, using one of the sifting litter boxes reviewed in this article. Cleaning after your feline’s business is about to become an easy task, that anyone in your household (even small children) can perform. How does a sifting litter box work? 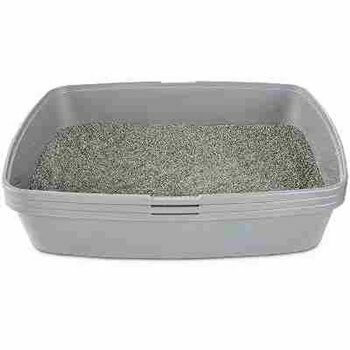 Really simple – Unlike Automatic litter boxes, These litter boxes will consist of usually 2 bottom pans. Sometimes there will be a third, spare bottom one. When you decide it’s time to clean the litter box, simply lift the sifting pan, allowing clean litter to fall through and waste clumps to get caught in the sifting pan. All you have left to do is dispose of the dirty waste and pour in new litter through the sifting pan and into the bottom pan. Easy as that! Save time. Cleaning up after your kitty becomes real quick and easy. Ease of use – no more fiddling around with your cat’s mess. Just pour out the dirty waste, add some clean litter. That’s it! Reduce the amount of litter you use – When you use the sifting pan to discard the waste, clean litter will fall through, saving you on cat litter You will find you use your litter bag to its fullest. There are lots of litter boxes that have many useful features, such as covers for odor control or raised sides so that litter doesn’t get spread around. To make it easy for you, we have reviewed some of the best sifting litter boxes out there. Choosing the right one for your cat will be no trouble at all. The Luup Litter Box contains a system where the user only needs to lift the sifting mechanism from the lower part of the litter box and discard the waste. It contains 3 levels of sifting trays, each designed to catch pet waste. It also has a 180-degree turn system for reassembling the box when the pet waste is discarded. If the system is not correctly put back together, the litter box is meant to rock side to side to alert the owner. The litter box is designed with a spill guard and since the waste comes in direct contact with the box, it is also made of anti microbial plastic material. Non-stick coating make it super easy to clean. Enables to change the cat litter in under 20 seconds! Innovative design plus very simple to use. A bit expesnive tio compared to other litter boxes. Might get a bit messy when cleaning. Luuup Litter Box is the new star in the sifting litter box arena. It gets the job done very simply and easily. 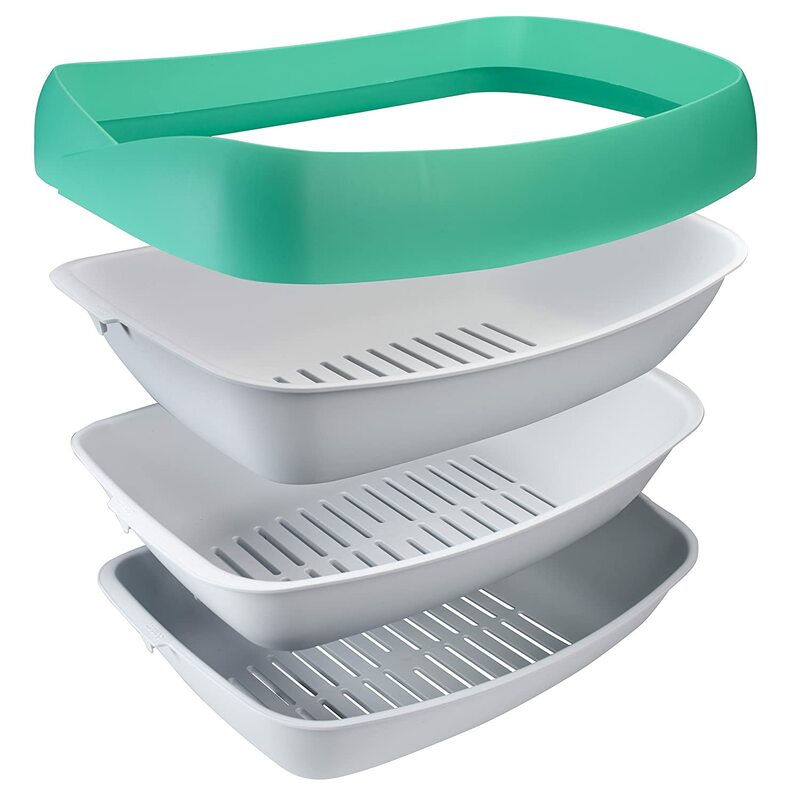 The 3 Sifting Tray system is super stylish and easy to use. You just have to sift the initial pan and put away the contents, then put the litter in the other pan as you put the clean litter in it. The Purina Tidy Cats Litter box kit system is designed to keep a cats litter area mess free. The system has specially designed pads on the bottom that are used for odor control. These disposable pads absorb the smell of urine and are located in a pull-out tray system for disposal. The system uses litter in the form of pellets rather than the usual clay or sand litter and Purina claims these pellets contain almost no dust. These pellets are designed to minimize the amount of litter that is scattered outside of the box by your cat. The pellets also allow for feces to remain at the top of the litter box for easier disposal. Standard high-sided litter box to reduce litter spills. Extremely easy to sift and clean. Can get messy when scooping lots of litter. The thin plastic seems a bit flimsy. This litter pan is easy to use. It saves the time it would take you to clean a traditional box. Very convenient and worthwhile. Pads in the bottom of the box are easily disposed of, while the box can be cleaned for re-use, making it a good choice for anyone looking for fast and easy cleaning. Another great thing is that this product is completely recyclable. Great for anyone concerned with environmental issues. The Van Ness Cp77 system features a design that is meant for odor control and also does not require scooping litter. The system is fully enclosed with a plastic flap that lightly covers the entrance to the box. There also is a handle on top of the box for easy transportation if needed. Another feature that helps with odor control are the zeolite air filters that are replaceable. The plastic material is resistant to stains and resistant to odor as well. The system comes in a large and Extra-Giant size for cats that need the space. Made in the United States. Sleek design, stain resistant material. Closed box for more odor control. Great for one or more cats. Lots of parts to it, takes some work to assemble. Perfect for cats fed with dry food mostly, not great for cats that have issues or leave a less solid mess behind them! This pan has a finishing that is stain resistant and highly polished. The pan makes a 15 minutes job take only 5 minutes. Its added height entrance opening reduces litter spill and comes in various colors for you to choose from. 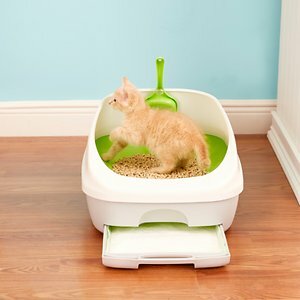 If you despised cleaning the litter box before, this litter box will make it easy for you. Better suited for larger sized cats, who will find it easier climbing inside. So Phresh Sifting Cat Litter Box is a three tray stacking system. In this system, the sifting tray is located in the middle rather than on the top layer. 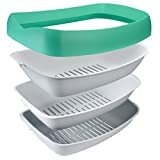 The user lifts the first tray, the sifting tray, and the rim up from the bottom to sift the litter into the lowest part of the box. The cat litter can then be disposed of. The system works with any cat litter that is able to be sifted through the first two layers of the box. The material is a light gray plastic and the dimensions are 19.75 inches in length, 15.3 inches in width, and 9.5 inches in height. This product is manufactured in the United States. Fairly priced, works with most cat litter types. Sometimes difficult to find because it is out of stock. Plastic can appear a bit flimsy compared to other products. 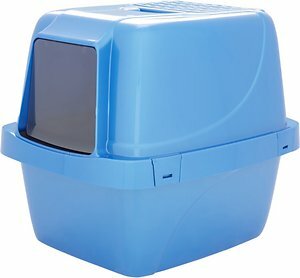 This litter box can be used with most cat litter types. The sifter for the cat litter is made to fit easily inside the base tray and using it to sift litter and separate waste is easy. Simple design for an easy cleaning job. 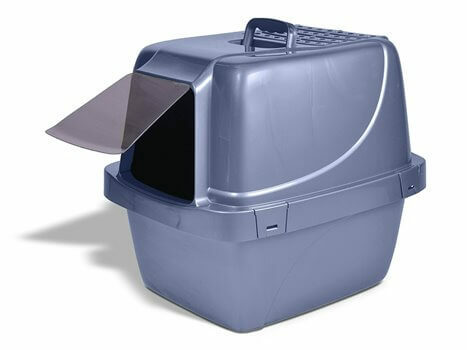 The Hagen CatIt SmartSift Litter Box is meant for small to medium sized cats. It features a lever system that, when moved out of the locked position, sifts the cat waste into the lower part of the box. The lower part of the box contains the unused litter that can be recycled to minimize loss of litter. The system does not need any sort of electricity to make it function and works manually. 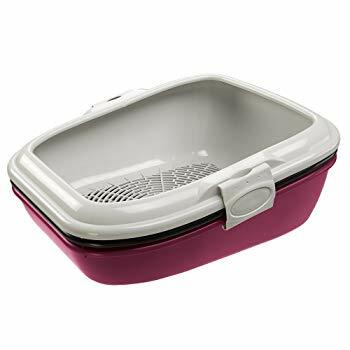 It is designed with a lid to minimize the amount of dust from the litter, comes with windows for viewing, and comes with the necessary pan liners. Scoops cat litter with just the pull of a lever. Sealed design, keeps everything inside, including odor. A little pricier than average. Not suitable for very large cats, even in the extra large size. This litter box is very easy to maintain as long as you follow the instructions. Maintain the litter at the pan line. You should then tip the pan after assembly, to ensure that the locks on the lid sides are locked. You should pop off the grate to scoop litter that has built up inside the grate. The Ferplast Birba Cat Litter Tray is made of durable plastic in a three tray stacking system. This system ensures that the correct amount of cat litter is being used with the sieving layer it has in place. When the sieving layer is removed from the other two layers, waste can be pet discarded. Litter that can still be used is saved in the bottom layer of the litter box. The box is meant to be used with litter that has a fine grain for maximum effectiveness. Hygenic lining bags may be used due to the two locks on the side of the box. 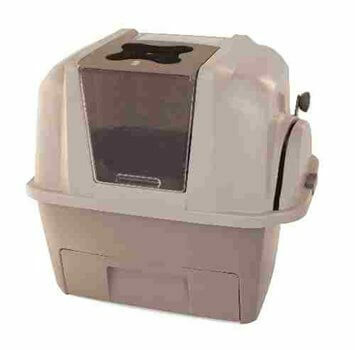 This box is ideal for multiple cats as It comes in multiple sizes for large or small cats. Made of heavy duty, long lasting plastic. Practical and super easy to use. Very low sides, some litter may spill sometimes. Lots of sticking of litter clumps to sides and bottom. The slats are not marked and therefore you have to remember how to fit the parts together. The different slats need to be reversed from the one on the bottom which is holding the litter. When you get the hand of it, cleaning up will become easy. The Lift n’ Sift Cat Litter Box can be used with clumping or regular litter. Its main feature is it does not require the use of pan liners. 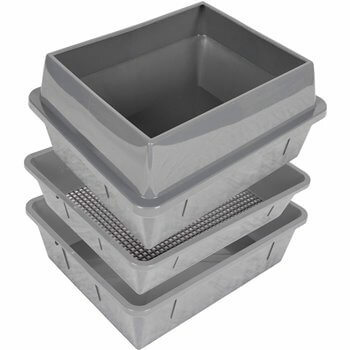 It is a three tray system with the sifter tray placed in the middle. The sifting layer features larger than average square holes for the clean litter to fall into the layers of the box below. The material is made out of a durable gray plastic. It comes in a universal size for all cats. It also features a litter guard that can be installed at the top of the box if needed. This litter guard prevents spillage of cat litter outside of the box. New litter is poured in from the top of the box when it is time to change litter. Some assembly is needed when the box is unpackaged. Works with traditional clay, clumping and gel litters. High sides for keeping the mess inside, a feature missing from many litter boxes. Fast cleaning and efficient usage of litter. Customers say it needs replacement after about a year. Holes in the sifter are big enough to let unwanted clumps through. Excellent choice for those kitties who like to dig around in the tray and throw their mess around, as the side panels of this litter box are higher than the average. You should keep in mind that the holes in the sifter are a bit bigger than usual, so when sifting some clumped litter may fall through. The Van Ness Sifting Enclosed Cat Litter Pan system has no need for a traditional scoop. The system is designed with a screen meant for sifting out waste and two pans for waste collection. When used with clumping litter, the sifting screen shifts into the pan below leaving clean litter in the pan and waste on top for disposal. When the sifting screen is replaced the process can start again. This system also comes with a lid that locks and covers the litter box as well as a door that is meant to help control odor. It is available in several sizes. Closed box gives better odor control. Transportable, plus it’s available at a great price. Needs additional thorough cleaning every so often. Very heavy compared to other litter boxes. This box comes with two bottoms; one for litter and the other one is empty and is the standby box, so that your kitty always has the box ready for use. The sift and rotate system makes removing the litter easy and together with the standby box cleaning your litter box is quick and painless. 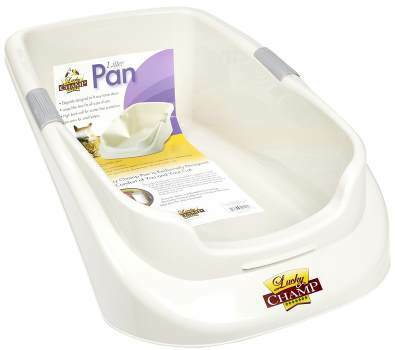 The Lucky Champ Litter Pan is designed with a much lower front wall. This is meant for easy access for older cats, cats with injuries, and small kittens as well. The back wall of the litter box is high to keep waste inside the box and off floors. It comes in one size for all cats and is made of durable plastic.The design also features plastic grips on the side for transportation if necessary. The dimensions of the box are 16.75 inches in width, 25 inches in length, and 9 inches in height. Practical shape for kittens but also great for larger cats. Very large (which isn’t necessarily bad). Due to the open, low front end, cats may drag some of the litter out. The pan has a lower lip that makes it easy for cats to get in and out. It has favorable length and it has big room to allow cats to move around. Great for felines that love spreading all over the place! The Sift Away SA-MC6 Pet Litter system is designed with two trays and a sifting tray. The trays are made to fit well together so when they are stacked they interlock and don’t come apart easily. 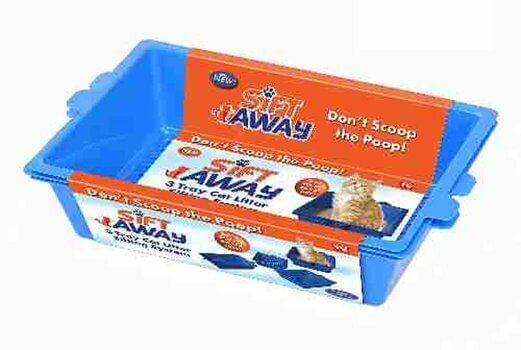 The sifting tray is located as the center tray and can be used with clumping or non-clumping litter. The system also comes with a splatter shield to minimize any kitty mess. The dimensions of the box are 17 inches in length, 12 inches in width, and four inches in height. It comes in one size for all cats. This litter box system is manufactured in China. Very low sides, doesn’t hold much litter. Cat urine gets stuck to the tray sides and the bottom grates. This litter box is messy and will work well only when the cat urinates on top of the litter at the middle of the tray. Suitable for those who have neat kitties. Most sellers on Amazon.com offer returns for most items within 30 days of receipt of shipment.